St Anthony Rest in Peace Sympathy Card. Holy Family Rest in Peace Sympathy Mass Card. Sacred Heart Rest in Peace Sympathy Mass Card. Rest in Peace Sympathy Mass Card. 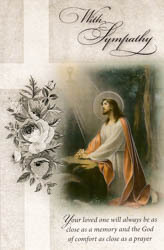 Sacred Heart of Jesus Rest in Peace Sympathy Card. 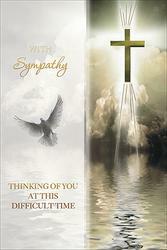 With Sincere Sympathy - Card. 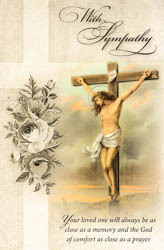 Crucifixion - Sympathy Mass Card. With Sympathy Jesus Mass Card.